Nick Jonas and Priyanka Chopra’s Official Wedding Photos: See Priyanka’s Two Wedding Dresses! Nick Jonas and Priyanka Chopra wed in two ceremonies over the weekend at Umaid Bhawan Palace in Jodhpur, India, and now she’s released the first official portraits from their weddings! In the first ceremony, which honored Western traditions and culture, the bride dazzled in a custom, lace gown from Ralph Lauren. The design house told Access in a statement that the embroidery on the stunning gown took 1,826 hours to complete! The gown was a hand-beaded and hand-embroidered dress, featuring floral and scroll motifs and lace-effect tulle appliqués with scalloped sleeves and a high-neck collar. The embroidery—which included mother of pearl paillettes, crystal seed beads, and Swarovski crystal. It was closed with 135 satin-covered buttons. Underneath the long-sleeve gown was a strapless column dress made up of 2,380,000 mother of pearl sequins. The look was absolutely jaw-dropping, and Priyanka wore her dress with a 75-foot veil to complete the look. According to her interview with People, she felt like an absolute princess on her wedding day and carried a bouquet of tuberoses, her favorite flower. Priyanka also took a nod from her royal bestie Meghan Markle and had special phrases and motifs embroidered into her dress that were symbolic. 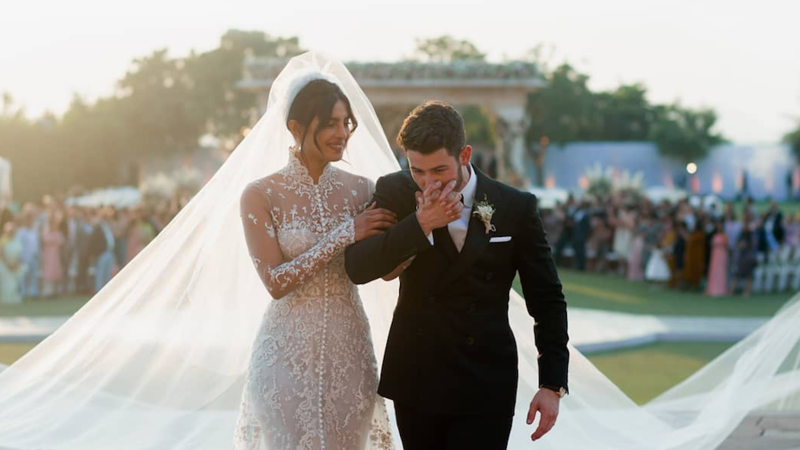 She had her groom’s name, Nicholas Jerry Jonas, their wedding date, her parents’ names Madhu & Ashok, Om Namah Shivay (a Hindi mantra invoking Lord Shiva), and the words family, hope, compassion and love embroidered into the dress. For his part, Nick looked dapper on his wedding day in a Purple Label six-button double-breasted black tuxedo and custom patent lace-up dress shoe. Inside the lapel of the tuxedo, he added a small piece of lace from the Bride’s dress embroidered with the Urdu words “My Jaan” which translates to “My Life,” Ralph Lauren’s design house revealed. Ralph Lauren also dressed the entire bridal party, which included mother of the bride, Dr. Madhu Chopra, mother and father of the groom, Denise and Kevin Jonas, Sr., bridesmaids Sophie Turner and Danielle Jonas, groomsmen, Joe Jonas, Kevin Jonas and Frankie Jonas, and Armie Hammer’s daughter, Harper. In total, the bride and groom had 24 bridesmaid and groomsmen, who were all outfitted in blush gowns and tuxedos. 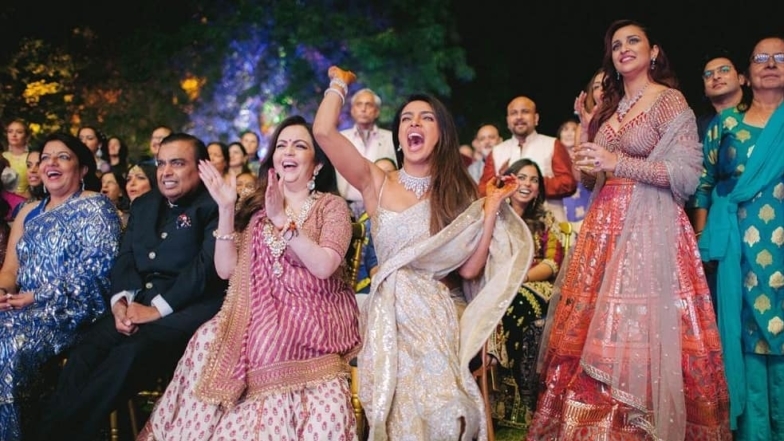 The Western wedding took place on the palatial grounds of the Palace and Priyanka dazzled with her royal, cathedral veil as she made her way down the aisle with her mother, Madhu by her side. Her father died of cancer in 2013. #NickJonas wipes away a tear when he sees #PriyankaChopra walk down the aisle during one of their beautiful ceremonies. Tap the link in our bio to watch the full special on @peopletv. ❤️ | 📷: (c) Purple People America, LLC and NJJ Entertainment, LLC 2018. Wedding footage by @CalebJordanLee of East West. A string quartet played during the ceremony, which was officiated by pastor Kevin Jonas Sr.
“It melted my heart. Being able to have two big weddings, in India, with our closest family and friends was unbelievably special,” Priyanka told People magazine. Nick admitted to People magazine that he was definitely feeling all the emotions. The couple said “I do” again in a Hindu ceremony on Sunday. This time, the bride wowed in a traditional red sari, which was embellished with floral motifs. She also teamed the look with stunning jewelry from Sabyasachi Mukherjee. For his part, Nick wore a traditional gold ensemble with a turban. He matched Priyanka by donning red jewels and a set of gold shoes. Nick also rode into the ceremony on a white horse, according to reports and an elephant was seen at the wedding. Nick Jonas & Priyanka Chopra’s Wedding Pics!